No one will ever know how many died in the 2004 Tsunami because so many of the towns and villages affected were in remote areas with few records of population. It is possible that more than 200,000 were drowned or buried in mud in just a few minutes. 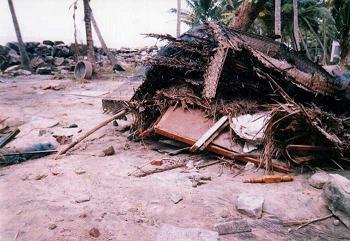 The worst affected areas were close to the earthquake epicentre, but the wave caused destruction as far away as India and Africa (East Coast). Could Tsunami deaths have been prevented? Many scientists had been warning of the risks of a severe Tsunami in the region, and continue to warn of future Tsunami risks. 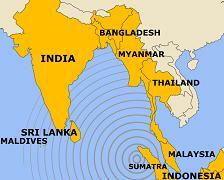 The 2004 Tsunami was caused by a major shift in part of a well-known fault line. The result was an increased pressure on other parts of the fault, making further earthquakes more likely. We never know when a major earthqake will happen. 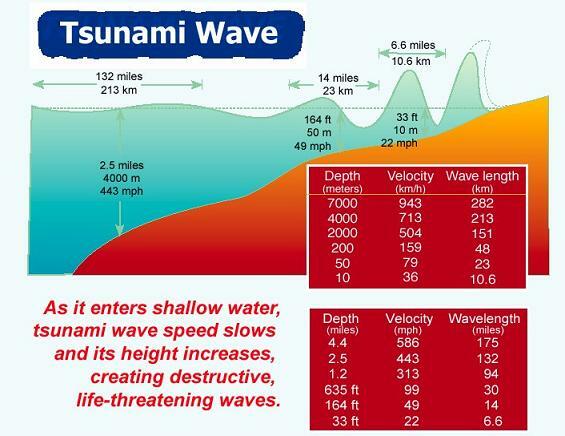 Tsunami waves travel very fast, and it is impossible to provide warnings for those very close to the earthquake zone which generates the wave. However, it is certainly possible to provide other coastal areas further away with adequate time for many people to get out of danger by moving to higher ground. Tsunami warning systems are now in place across the region most affected in December 2004 and were used during a recent tremor (April 2005). If they had been working earlier, it is possible that many tens of thousands of lives would have been saved. How are Tsunamis formed? 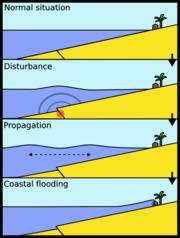 Tsunamis are caused by sudden movement of the sea bed, during an earthquake or volcano. The result is a ripple of waves, just as if you dropped a large stone into a pool. Tsunami waves can travel at over 400 miles an hour through deep ocean, but don't usually cause any trouble at that stage to ships or boats. That's because the water is deep and the waves are long. Ships and boats just rise and fall gently - and may have no idea that a Tsunami wave has just passed beneath them. However as the wave approaches land, the water becomes more shallow and all the wave energy is concentrated into a very small area. The Tsunami wave slows down and increases in height. It is unusual for the wave to break: more commonly it just looks like a massive tide of water sweeping into the shore. 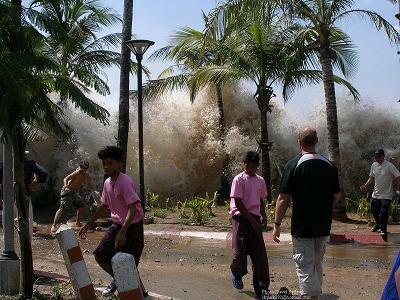 Tsunamis are often called tidal waves, and pictures often show tsunami waves over 30 metres high breaking over the coastline, although the reality is more that the water level rises rapidly, and later falls just as fast. 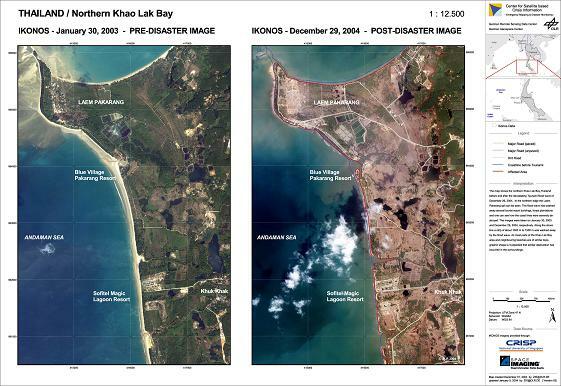 In the 2004 Tsunami, much of the damage was done by seawater returning to the ocean, and also by a second wave a few minutes after the first. Here is some useful data showing how the speed of a Tsunami wave falls as it approaches land, and how the height rises. You can see the graph more clearly, and print it out, by right-clicking on the image and saving it first. How often do Tsunami waves happen? Tsunamis happen far more often than most people realise. Hawai sees a small tsunami every year and Alaska, Californai, Oregan, Washington, Japan, Indonesia, Malaysia, Philipines, India and other parts of the world can all expect to experience larger or smaller tsunamis in the future. Tsunami earthquakes are those where there is a major shift of the seabed as two tectonic plates slide against each other, releasing forces many times as great as an undersea nuclear bomb. Tsunami videos can be very upsetting to watch if they show the reality of what happens when a mega Tsunami hits land, buildings and people. It is shameful that some people see such things as entertainment. It is impossible to understand the full power of these waves unless you have seen one. Tsunami video - dramatic film clip taken by a holiday maker as a huge Tsunami wave sweeps up the beach and into the restaurant of the hotel, showing footage of Tsunami damage, tsunami wave pictures of tsunami victims and scale of tsunami disaster. Sad to see the video is listed in an entertainment area - warning: may be unpsetting to younger children. It is hard to understand how people cope after a big disaster. Yes I agree. Impossible for other people to imagine. OH GOD WHY DID U DO THIS............??? HAVE U SEEN THOSE CHILD WHO NEVER SEE THEIR PARENTS ..
Re: OH GOD WHY DID U DO THIS............??? indeed it happened there, same time very many p'ple do say that tsunami comes a punishment but according to me it's just developed from the sea level changes due to the different hat generates from the center, that's my research!. anyway how are you! Im doing a project on the 2004 tsunami and I really needed alot of info and this really helped! that is not funny how would u like it if your houes got destroyed or something .......think about it! plz don't say stupid things like that and expect not tobe corrected on it. 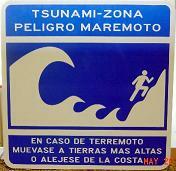 I WANT TO KNOW ON WHAT SITE I CAN SEARCH FOR INFO ON TSUNAMI`S. A SITE THAT GIVES A COMPLETE FACT REPORT OR ANY THING. All you have to do is google it. I googled tsunami pictures,and it brought up several details and graphs. I wish to state that man often forgets that he/she has equally manifactured sometime valuable and has provided a manual book with which to operate it. What do we expect from the CREATOR of the UNIVERSE after all forms of guidance have reached us. Tsunami is a lesser punishment to what happened to the people of Thamud, whom Allah sent WIND and not WATER to wipe them from the surface of the EARTH. Shall we not ponder? In what country doyou live. do you have any sujestions? plus that is realy sad because my dad died in the tsunami. ohh my gosh this is horrible. i feel so bad for brooke. that must be hard. Hello , my name is Karris and i am really sorry to hear about your Mother , it must of been really hard for you , without my mum i wouldnt no what to do . Was there any other members of your family hurt ? i think that the tsunami has touched so many lives, i am so sorry for the families that have lost someone. i can't even think of the pain that you are feeling and i can't even begin to imagine. i am so sorry to hear that my name is ayla and my dad got his back broke and i am only 11.
hello my name is brooke telietha filer and my mum was killed in the tsuami. Dear Brooke, I am so very sorry to hear about what happened to your mother. It must have been such a terrible time for you. In what country do you live? Were other members of your family OK? im soory maybe she thinks of you in heaven my cat was killed so i know how you feel i wish that was me not your mom soory that had to happen to her. i am so sorry of your mother.it was suddenly happened.i have saw it in news.wish you a happy life brooke.